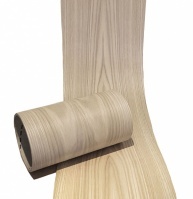 The White Oak Wood Edging is un-glued and comes in a 2mm thickness. It is available in 22 & 30mm widths, select from the drop down box above. Price is for 100 mtr roll. Really good quality solid oak edging which gives much more of a quality feel than the iron-on equivalent in my opinion. The grain pattern is ideal and will look good in the finished project. Delivered promptly-can't fault the product or service.